Dismiss those old-fashioned notions of sugary Christmas chocolate liqueurs – Matthieu de Gottal's whisky-fuelled truffles are a class apart. 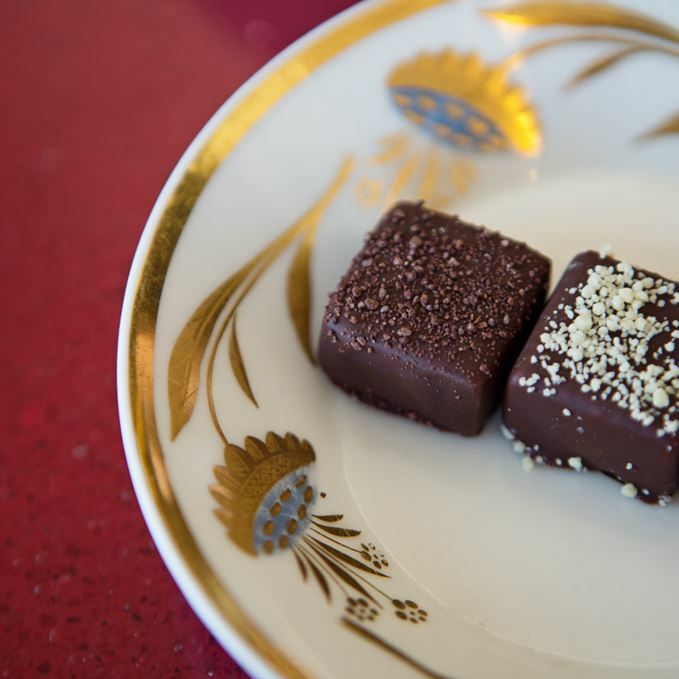 Belgian-born Matthieu is as passionate about Scotch as he is about perfecting a beautifully tempered ganache. Here he teaches Fiona Beckett some of the tricks of his trade. For any whisky lover, chocolate is an obvious pairing, but a whisky in chocolate that manages to preserve the original and unique flavour of the spirit? That’s more of a challenge. 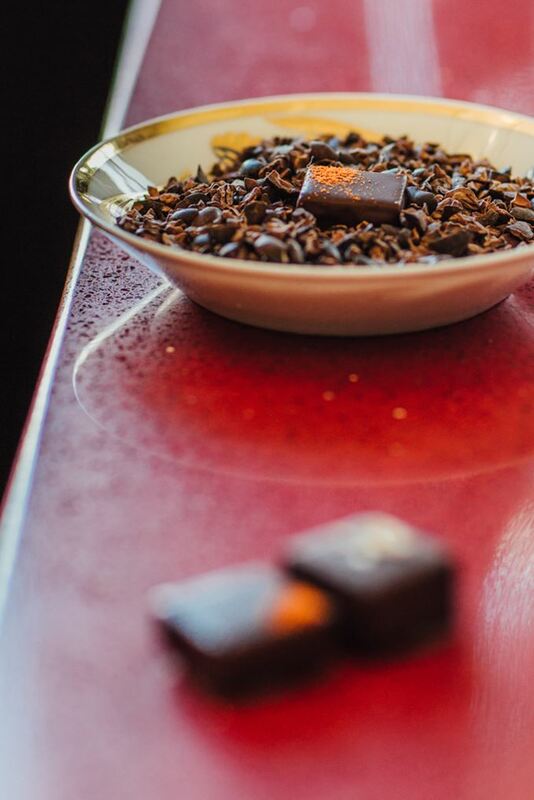 But it’s one that’s been conquered by a new chocolatier, Matthieu de Gottal, who has already won five medals and a trophy for his whisky chocolates since he started his business in November 2014. Maybe it’s the Belgian blood flowing in Matthieu’s veins (he was born and brought up in Brussels, then sent to boarding school in England at the age of 14), but he’s always been obsessed with chocolate. ‘I baked my first chocolate cake when I was four,’ he says proudly. And yet his career at first took him in a rather different direction. After studying hotel management in Switzerland, he worked his way around the world as a food and beverage manager – ending up in New Zealand, where he ran the Christchurch club before the devastating earthquake four years ago. With a new baby to care for, he and his wife Tara decided to return to the UK, where Tara encouraged him to realise his lifelong ambition of being a chocolatier. After he trained at the Swiss-owned Barry Callebaut chocolate academy in Banbury, de Gottal found a small production unit In Nailsworth, Gloucestershire, and set to work. 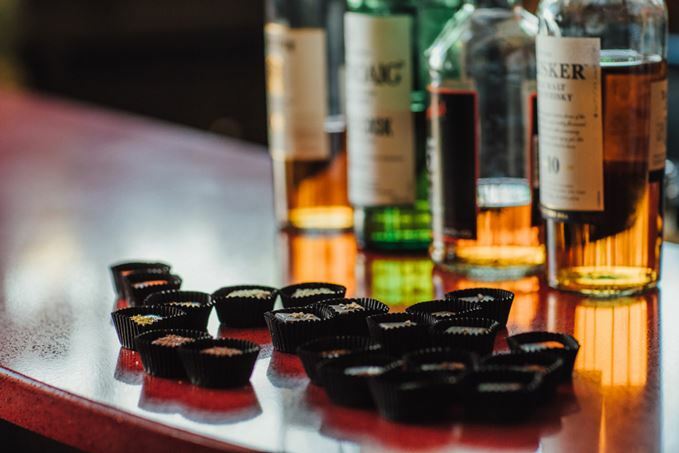 His idea of making whisky-based chocolates wasn’t an entirely new one but it had never been done from a connoisseur’s perspective – where the quality of the whisky was as important as that of the chocolate. The whisky that garnered him his awards was a Penderyn Sherry Cask from Wales, which he simply mixes with butter, Venezuelan white chocolate and honey. The flavour is gentle and sweet but not in any way sickly. People who don’t like white chocolate say ‘Oh my God! - it’s amazing’. He turns Aberlour – ‘the first malt I bought when I was 18’ – into an ‘Atholl Brose’ truffle made with whisky-soaked oats and honey. Some of the whiskies de Gottal uses are much more intense. A Laphroaig Quarter Cask, for instance, which he blends with 55% Madagascar milk chocolate, seems deceptively mild at first – then that characteristic hit of peat and smoke comes unmistakeably through. As I watch him at work developing a new ganache recipe, what strikes me is his meticulous attention to detail. First he jots down the quantities of ingredients he plans to use – organic butter, Cotswold honey, a carefully measured dollop of the shiny, dark Madagascar chocolate which is being whipped into a luxuriant mass in a state-of-the-art Italian tempering machine, and a generous, 58ml slug of Laphroaig. ‘I use far more whisky than anyone else, I suspect,’ de Gottal laughs. A generous teaspoon of fragrant Kashmiri chilli goes in at the end. ‘Won’t it be too strong?’ I ask nervously. ‘Well, we’ll see!’ he replies. De Gottal’s perfectionism has already paid off. 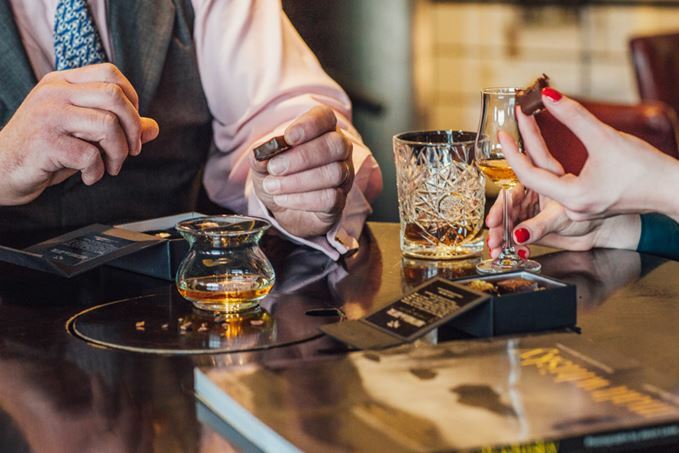 In the eight months since he’s been trading, he’s amassed five medals and a great deal of acclaim, including a Gold Award and a Trophy in the International Chocolate Awards for his Penderyn Blanc. At a recent chocolate show in Shrewsbury he completely sold out. ‘And Greg Wallace of Masterchef said my Sweet Peat truffle (with Laphroaig) was the best he’d tasted at the Christmas Chocolate Festival in Islington.’ He seems even more chuffed with that than the medals. 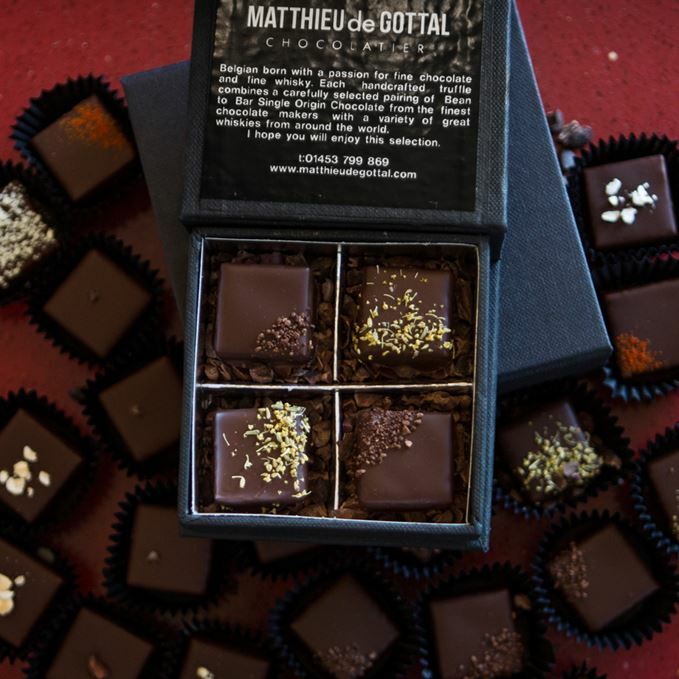 Matthieu de Gottal’s chocolates are currently available from The Chef’s Pantry, Cheltenham and from Penderyn distillery in Wales, but will shortly be available online at matthieudegottal.com. 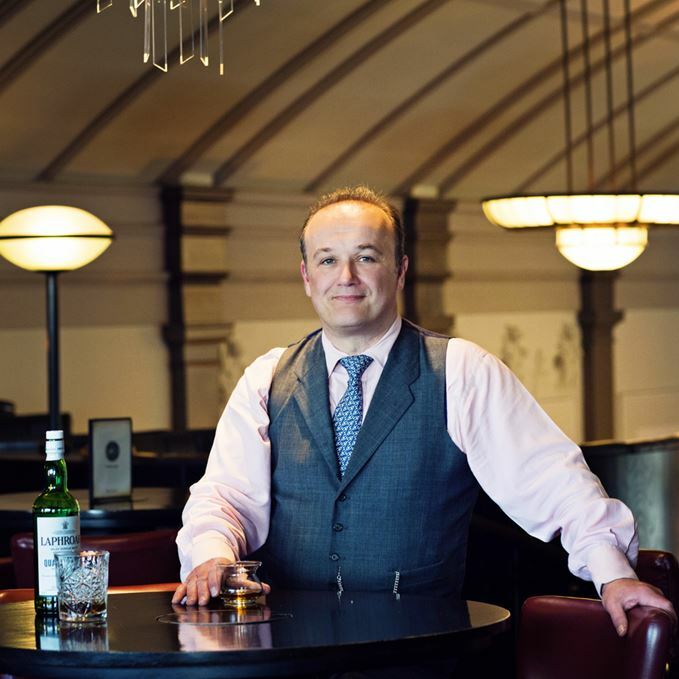 The spirits retailer is set to open a second London store on Great Portland Street next month.